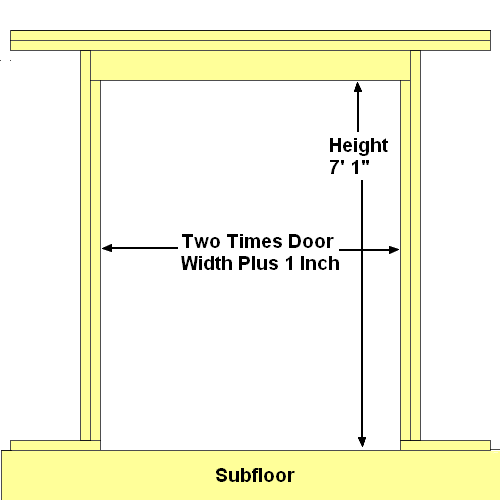 Determining what size to make rough openings for single pocket door framing is a simple process. Almost all hardware manufacturers state in their instructions, width of the rough opening is two times that of the door plus one inch and the height is seven feet one inch. Bear in mind that converging and by-pass doors are different and the hardware supplier should be consulted for proper framing sizes. The rough opening may seem very large, but bear in mind that you are actually framing the door opening to accommodate the door while it is open and closed. The height is taller than a normal interior door to hide the pocket door track that is supplied with the hardware kit. Due to the large size of these openings, I recommend that you install as wide of a header as possible in a load bearing situation. In a non load bearing situation, I usually use a two by four header built and installed like a normal load bearing 2 x 12 header. The job of installing the door hardware kit usually falls to the rough framing carpenter. The better job you do of installing the kit the easier it will be on the trim carpenter. These kits are usually a universal frame kit and require cutting down the door header and track to the proper length. Refer to the instructions supplied with the door hardware kit to determine the proper length. Insure that the rough opening is plumb and the header level, if not the door will be a thorn in someone's side forever. Here is a link to directions on installing pocket doors that are typical of most. First designed more than a century ago to save space. they became popular in Victorian style homes. Primarily used as entrances to fancy dining rooms, libraries, sitting, rooms, or as simple room dividers. They began to fall out of favor when people grew tired of them falling off the track, getting stuck inside the wall, grinding, and squeaking caused by the inferior hardware. Sometimes referred to as "trailer house doors" they were all but forgotten by architects. New developments in design and hardware have resulted in doors that operate smoothly, quietly, and have rollers designed to last a lifetime. Couple this with their space saving features and they are increasing in popularity once again. People confined to a wheelchair or using a walker find a sliding door much easier to navigate than a normal hinged door. With the current trend towards smaller more energy efficient homes a pocket sliding door can be incorporated into the home to help free up space that would be impossible with a normal door. Such space can be utilized for a computer desk, bookshelf, entertainment center, etc.